A Manchester-based publisher has beaten off competition from the likes of the Daily Mail and Cristiano Ronaldo to be named the world's most engaged Facebook page and online video channel for 2016. According to data from Tubular Labs, UNILAD's Facebook content picked up almost one billion Facebook likes, comments and shares across the year. During the year it also clocked up over 25bn video views across YouTube, Facebook, Vine and Instagram. Announcing the news, co-founders Sam Bentley and Liam Harrington said the site took pride in "always being organic and letting the audience decide what content works best". Unilad, which has 55 staff split between Manchester and London, has over 23 million likes on its flagship Facebook page and several million more likes across subsidiary pages including Unilad Tech, Sound, Adventure, Fitness and Gaming. 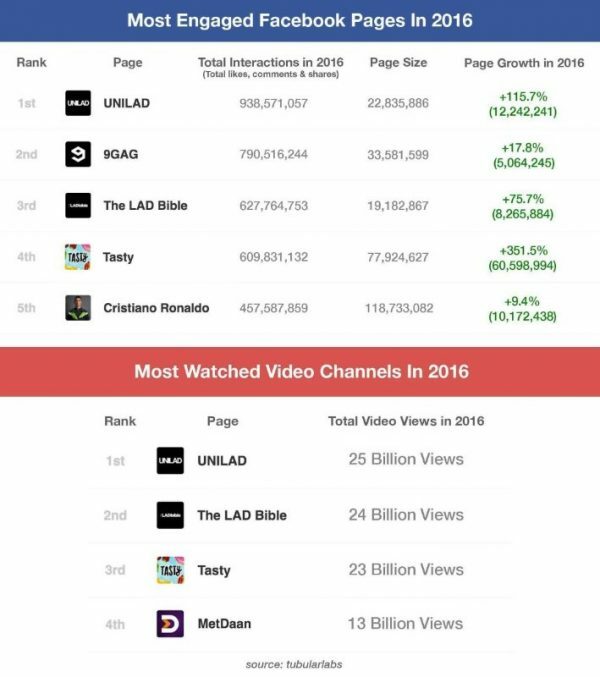 Fellow Manchester publisher The LAD Bible was named the world's third most engaged Facebook page last year, with the second highest number of video views.